I’m still not a fan of the style of animation, but thus far, that’s the only real knock I have against Disney XD’s Star Wars Rebels. 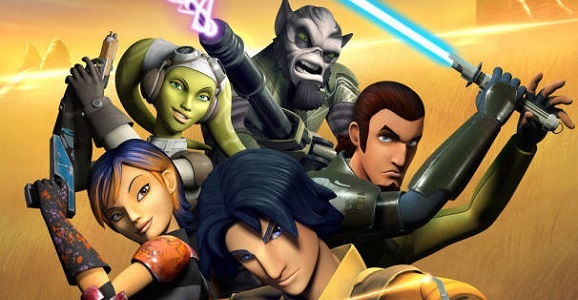 The first new addition to the post-Disney buyout of Lucasfilm Star Wars universe, more than anything, watching Rebels feels like watching the franchise you love. There’s that familiar sense of high adventure and swashbuckling action that George Lucas originally lifted from the movie serials he loved as a kid, and it’s as much fun as you hoped, even if it is obviously aimed at a much younger audience. Set between the events of Revenge of the Sith and A New Hope, Rebels shows off a world where the Empire is in the process of tightening its oppressive grip on the galaxy, and on the backwater planet of Lothal, a group of resisters, the seeds of what ultimately becomes the Rebel Alliance, stands up and fights back. Into their midst stumbles a wayward young Orphan, Ezra, the Luke Skywalker of this particular saga, and the undercover Jedi leader Kanan takes him under his wing, mentoring the boy, developing his abilities with the force.